Travel from Windhoek to the spectacular Kalahari desert to see the flora and fauna that have survived thousands of years in this desert, continue on to Sossuvlei with some of the highest sand dunes on earth as well as Sesriem Canyon. Visit Twyfelfontein, a World Heritage site where over 2500 rock engravings and rock paintings cover the eroded surface of a pre-historic desert. Two days are spent in Etosha National Park for extensive game viewing experiences before driving back to Windhoek and taking in the surrounding area. Having arrived at the International Airport, you collect your vehicle at the relevant car rental company kiosk and travel the short distance to Windhoek. Having checked into your modern and luxurious guest house, enjoy the day at leisure or explore the city centre with its colonial-style buildings, street cafes and craft markets. Overnight: Pension Uhland. Approx distance 50 kms. In the morning you travel into the largest sand mass on earth, the Kalahari Desert. The bushman refer to it as the “Soul of the World”, an emotive description for this area! With its deep red sand dunes and endless grass plains interspersed with Acacia’s and shrubs, it is the only form of survival for a vast amount of specially adapted wildlife such as Oryx, Springbok and Ostrich. Enjoy the opportunity to experience the fauna and flora that has survived this desert environment for thousands of years on a guided nature drive in the late afternoon, ending the day with a sundowner drink on one of the dunes. Overnight: Kalahari Anib Lodge. Approximate Distance: 280km (breakfast included). Today you have the day at leisure. You can explore the area by enjoying one of the walking trails offered by the lodge, join the afternoon nature drive again or simply relax at the pool. Overnight: Kalahari Anib Lodge (breakfast included). This morning you travel via endless plains and along striking mountain ranges into the Namib Desert, the oldest desert on earth. Your lodge is situated at the foot of a petrified dune belt as well as the gate to two of Namibia’s most celebrated attractions: Sossusvlei, with some of the highest sand dunes on earth, and Sesriem Canyon. Both are visited the next day. At your lodge you have a wide variety of activities on offer, only some of which include scenic nature drives, guided and unguided walking trails as well as photographic excursions on the property. Overnight: Namib Desert Lodge. Approximate Distance: 360km (breakfast included). 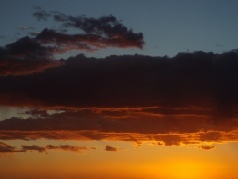 Before sunrise you travel to the gate of the Namib Naukluft Park. The best time to experience the Sossusvlei area is at sunrise when the light paints the dunes and desert palette into deep red, apricot and purple – this part of the day is also the most forgiving, as you are not exposed to the hot afternoon sun when clambering one of the mighty dunes. 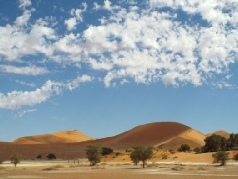 From Sossusvlei visit Dead Vlei, a surreal white clay pan surrounded by monumental dunes and dotted with age-old camelthorn trees. Traveling back, visit the Sesriem Canyon, an 18 million year old gorge eroded into the conglomerate floor. Having returned to your lodge, cool off in the sparkling pool or take a refreshing drink while overlooking the desert plains. Overnight: Namib Desert Lodge. Approximate Distance: 300km (breakfast included). Today you travel via the Namib Naukluft Park to Swakopmund, a tranquil coastal town situated between the Namib Desert and the Atlantic Ocean. Visit the Welwitschia plains and the aptly named Moonlandscape, two of the attractions during this scenic drive. In Swakopmund, you will have the option of participating in some of the adventurous activities on offer. These could include scenic flights, dolphin cruises, quad biking, parasailing, dune boarding and parachuting. Your accommodation is serenely situated along the mouth of the Swakop River in close proximity to the centre of town. Overnight: Swakopmund Sands Hotel. Approximate Distance: 370km (breakfast included). On your way to the Damaraland you can visit large lichen fields as well as the largest fur seal colony in southern Africa at Cape Cross. You travel into Damaraland past Namibia’s highest mountain, the majestic Brandberg Mountain, which reminds of the volcanic era millions of years ago. Your lodge for the following two evenings is situated at the foot of a huge Mountain range, and you can enjoy the cooler part of the afternoon at a sundowner spot that overlooks the surrounding plains. Spend the afternoon along the huge pool in the unique garden. Overnight: Damara Mopane lodge. Approximate Distance: 340km (breakfast included). After breakfast visit Twyfelfontein, a World Heritage site where over 2500 rock engravings and rock paintings cover the eroded surface of a pre-historic desert – this area was inhabited by Bushmen some 6000 years ago, as it was rich in water and consquently visited by a rich diversity of game. A visit to the Burnt Mountain and the Organ Pipes are additional geological phenomena that make the Damaraland so unique, and by visiting a traditional Damara village you get to meet the indigenous inhabitants of Damaraland and learn how they have survived here for thousands of years. On your way to your lodge visit the Petrified Forest interspersed with Welwitschia Plants, the oldest living desert plant on earth. The Vingerklip, a sandstone conglomerate with a height of 35 meters, is situated close to your lodge and can be visited in the afternoon or the morning of the next day. Overnight: Damara Mopane Lodge. Approximate Distance: 340km (breakfast included). After a relaxed breakfast, travel north to one of the most famed National Parks in Africa, where you will spend the next three nights. Your elegant lodge is situated on a hill with a magnificent view over the Mopane landscape; on one of the next 3 days dinner will be enjoyed in the “Shebeen Bar”, which entails live traditional music, open fire, cold Namibian beer and wine as well as an overall African dinner experience. Overnight: Etosha Safari Lodge. Approximate Distance: 500km (breakfast included). You have the entire next two days available for extensive game viewing experiences. The Etosha National Park surrounds a parched salt desert known as the Etosha Pan, and is home to 4 of the Big Five - Elephant, Lion, Leopard and Rhino. The parks waterholes support a diversity of mammals and birds, including species such as black-faced Impala, cheetah, and Namibia’s smallest antelope, the Damara Dik-Dik. Shortly before sunset you travel back to your lodge. Overnight: Etosha Safari Lodge (breakfast included plus one dinner). In the morning you travel back south into the vicinity of Windhoek, where your guestfarm is situated next to a dry riverbed and within the majestic Otjihavera Mountain range. The remainder of the day is spent at leisure along the sparkling pool or the viewing deck, while you also have the option of exploring the rich diversity of game species on an open-vehicle drive or a scenic walk. Overnight: The Elegant Farmstead. Approximate Distance: 390km (breakfast included). 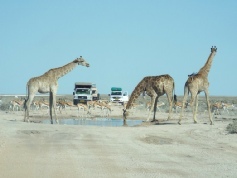 Namibia fly-drive holidays Prices are per person based on two sharing. Prices include flights, transfers and accommodation, and are subject to availability. Flights from Heathrow - other departures also available, call for details. Holiday ref JET0917MU.